Who Is This Scott Weiland Guy? 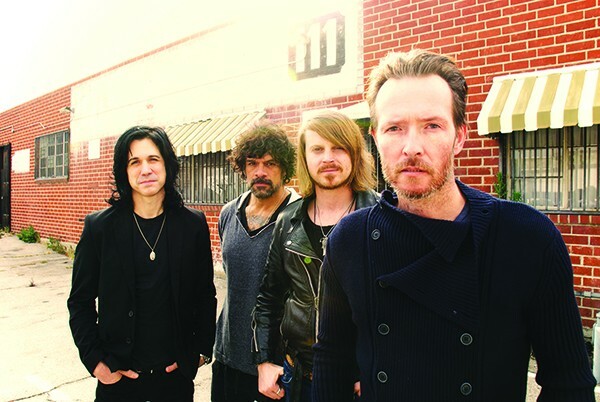 As with Batman movies and ecstasy, I apparently missed out on the past 20 years of another cultural force, Scott Weiland, who is scheduled to appear in town with his band The Wildabouts at the Century Center, that pavilion space sprawling between GoodLife Brewing and Volcanic Theatre Pub. Oh, sure, I know the name Stone Temple Pilots, and songs like "Vasoline," but sort of categorized those as some music simply generated by a computer programmed to create radio-friendly "grunge," sort of the equivalent of the Gap producing flannel shirts to surf that trend in the '90s. But I'm trying to quickly catch up to the rest of you who were listening to college radio in the '90s, and recognizing that all this time Weiland has been lurking there in the shadowy corners of my cultural blind spots, from songs on the Avengers and Great Expectations soundtracks, to a Milwaukee, Wisconsin radio station playing his album of Christmas songs repeatedly for 24 hours starting Christmas Eve and ending on Christmas Day. "Plush," Core, Stone Temple Pilots (1993): A ubiquitous anthem in the mid-90s, this song had some of the same grinding guitar chords and drum fills as its northern counterparts, but, as to be expected from a southern California-launched band, more up-beat vocals than the mopey Kurt Cobain. "Barbarella," 12 Bar Blues, Scott Weiland (1998): Weiland explores new territory with this solo album, with Beck-like curiosity in the song's arrangements and experimentation. And, the pay-off is huge, showcasing his voice's versatility both as the familiar just-short-of-screaming force but also with slight twang and sweetness on other verses. "Slither," Contraband, Velvet Revolver (2004): The broken pieces of Guns N' Roses gathered around the forceful singer for a short-lived, hugely popular heavy metal band, scoring Weiland a repeat Grammy for the Best Hard Rock Performance. There is the familiar bass drum metronome, and an almost hypnotic guitar that classifies the song as heavy metal, but I think that Ozzy would say it is easy-listening. Century Center, 70 SW Century Dr.